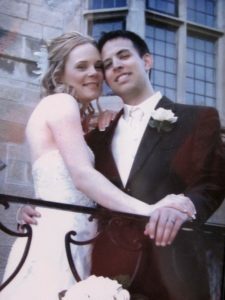 Make Your Wedding or Event Extra-Special with Murdick’s Famous® Fudge! 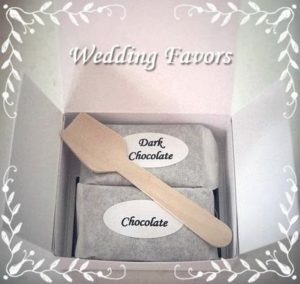 Our mini boxes of fudge are also perfect for for corporate events, family reunions, birthdays, and showers! Allow at least 3 days for shipping, if order is not going to be picked up. Please review the following options and call us at least 4 weeks prior to wedding or event date @231-436-4008 to finalize your order. The average price of printed boxes including fudge is $7.00/box (no tax). Shipping TBD. No charge for pick up orders. We suggest keeping flavors to one or two choices: chocolate or vanilla (however, we leave those options up to you); nuts are usually avoided because of allergies. (2-1/2) x (2-1/2) x (1-1/4) inches, and hold approximately 1/4 lb. of fudge. 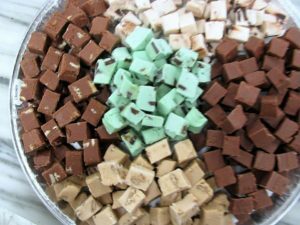 You may wish to just order fudge and make your own trays of fudge for your event. You can just order fudge from us and fill your own favor boxes. 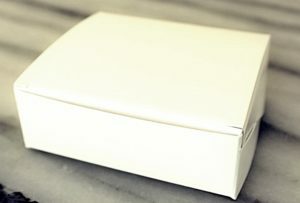 Favor boxes can be ordered online at many different websites — click here for examples: favor boxes. 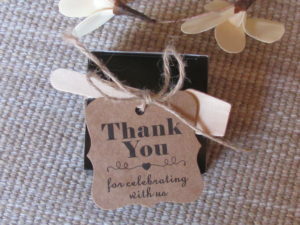 Black mini box decorated with twine, wooden spoon and tag. Please review the following options and call us at least 4 weeks prior to wedding or event date @231-436-4008 to finalize your order. The average price of printed boxes including fudge is $7.00/box (no tax). Shipping TBD–no charge for pick up orders. Our Authentic Murdick family recipe from 1887 is still used today - Fresh Cream, Real Butter and 100% pure Belgian Chocolate! Come in and taste the difference.